Readathon's seem to popping up left right and centre over the past few months and I've been eager to participate but have always been put off due to the short time frame as well as being overly busy but I discovered through Raeleen at Patfootandprongs07 about a new TBR called the TBRTakeDown created by Shannon at Leanlights. This really appealed to me as I'm desperately wanting to get the unread books on my shelf read and not just the ones I've just ought but the ones that have just been sat collecting dust and with the set challenges Shannon has created with this readathon, it's a great way to get them done. I can be a particularly slow reader but I'm going to try my best to get the books I've chosen for each category read and I thought I'd share those with you today! A book that has been on your TBR for over a year: Tuesday's with Morrie by Mitch Albom. I bought this definitely over a year ago if not over 3 years ago. I've tried to pick it up in the past but have soon put it down. I have read other Mitch Albom's books and so I don't see why I shouldn't enjoy this one. It's also quite short so should be a great one to get the readathon on the way. I think this story is based on Mitch Albom's real life and it's about revisiting his old college professor, Morrie, who's in his last months of his life. An unread sequel: Day 21 by Kass Morgan. This is the sequel to The 100 which is what the TV show is based off. I read the 100 and wasn't the biggest fan of the book and much prefered the TV series. However, I bought the sequel for my sister who did enjoy it. This is the only book I have access to that would fit into this challenge category but out of the other four, this is at the bottom of my list to try during this readathon week. The First book in a series off your TBR: The Hitchhiker's Guide To The Galaxy by Douglas Adams. I bought the complete set at the end of last year and still haven't got round to cracking into the series but this is now the great time to get the series started and cross one off my TBR Classics at the same time. It is such a well known, well read book and series that it would be wrong of me to not have a dabble into the story of Arthur Dent as they go hurting through space a Earth starts to break up. An "Out Of Your Comfort Zone" book on your TBR: Hollow Pike by James Dawson. This is a book I've never heard anyone talk about and one I was gifted two Christmases ago but as it seemed to be quite dark and slightly more of the horror genre, it's unlike anything I have or plan to read. I actually lent it to a friend and she said it was weird but was still an alright book. It's about a girl who repeatedly has dreams that someone's going to kill her but she thinks she just paranoid. There is also local legends of witchcraft that Lis chooses not to believe that must play apart in the book. All I know about this book it's what is given on the blurb. It's definitely out of my comfort xone but I'm willing to give it a read. A book you most recently bought: All The Bright Places by Jennifer Niven. I'm cheating slightly with this one as while it's one of the books I've most recently read, I'm already reading it but I think this readathon is the perfect way to encourage me to finish it faster. This is a well loved bok in the book blogger and booktube community about a Theodore Finch who wants to take his own life and Violet who's devastated after her sister's death. They meet on the ledge of the school's bell tower and that's where their story begins. So far, I have mixed feelings on his book but I've still got a lot to read but I'll let you know! So they are the five books I've set myself to read this week from the 1st-7th of June. It is very ambitious and so i don't expect to complete all of them but it will at least get me on my way to crossing off some more books on my TBR. Anyone can take part and so if you're not busy with exams or revision I think you should join me in taking part. 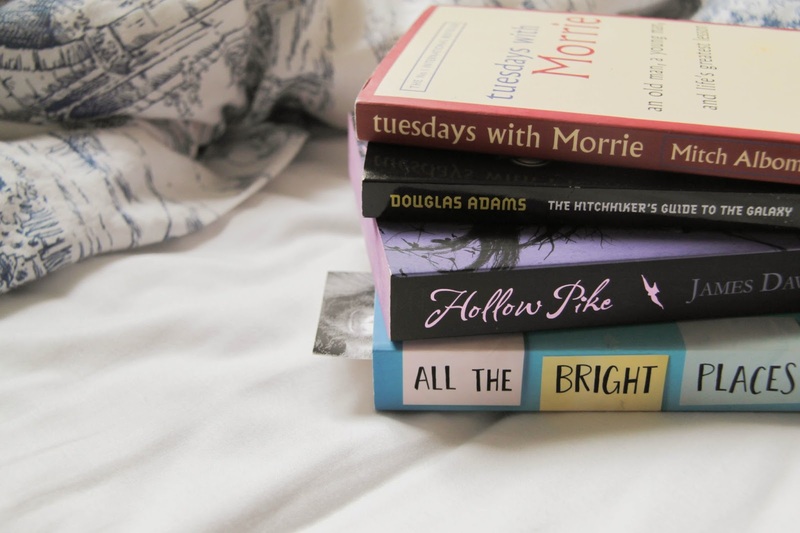 Have you ever taken part in a readathon?